At present, there are no tech classes scheduled. If you would like to suggest a topic, please use the link at the bottom of the page. The library has an Ultimaker 2 3D printer available for library users. Items to be printed can be your own designs or taken from the Internet. There is a small charge for printing. If you would like to find out more about 3D printing at the library, stop in to the Tech Center in the library or use this Contact Form for more information. If you want to try your hand at making your own design, you can use a CAD program, Computer Aided Design. You can download a free one or use a simple online one, like Tinkercad. Printable files can be found on 3D websites, such as Thingiverse. 3D Printing Request Form is available here. Have a question about computing or technology? Want a lesson in a particular program – or just a place to practice? Schedule a one-on-one session in our Tech Lab. Staff is available to help and give guidance. It’s a free service! Sign ups preferred and have priority. Three sewing machines are available for your project. Basic help available. Stop by with your project, no reservation necessary. 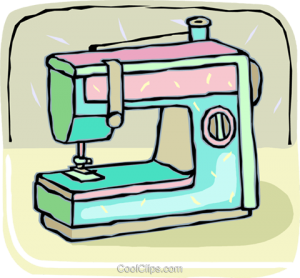 Or, sign up to reserve a sewing machine at the Main Desk, 585-593-3410, or wellsville@stls.org. Each class is taught by library staff. Classes are “hands-on,” designed for one student per computer. Space is limited, so pre-registration is required. Participants need to have basic mouse and keyboard skills unless otherwise noted. Classes are free and open to the public. Class topics vary through out the year. If you have an interest in a particular subject, use the link below to let us know. Call 585-593-3410, email, or stop in for more information or to reserve your spot. Send us your suggestion for a class.